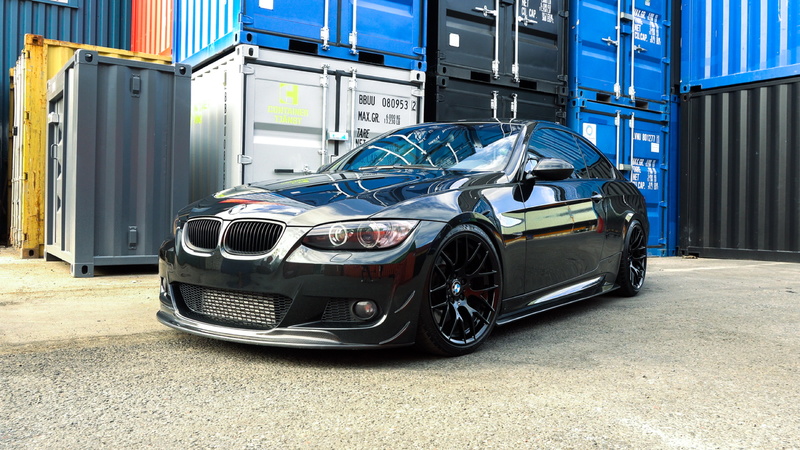 I always liked the BMW E92. I think it’s one of that classic BMW designs that will never grow old, it’s still a relatively small two door coupe and from where I’m looking at it, it really is a gorgeous looking thing. But there’s one thing I never fully understood: why would people chose a 335i over an M3 when it comes to the E92 chassis? I mean, how can someone voluntarily pick a three liter twin turbo inline six over a screaming V8. How?! In order to understand why, Martin took me for a spin in his highly modified and mean looking E92 335i. Not bad huh? And what I like the most about Martin’s car is just how well these mods all fit together. Nothing on this car feels out of place and I especially love the custom carbon fiber bits. Power is now up to 400+hp, we have no dyno figures yet so we don’t know the exact numbers, the engine pulls really well and if you floor it in first or second gear, you get a wonderful tail wiggle that you can hold on to until you release the throttle pedal. The car is wonderfully balanced, it’s loud, it’s really not as uncomfortable as it looks and the E92 M3 seats are a wonderful addition as they’re quite comfortable and also offer great side support. The M Performance alcantara steering wheel looks and feels wonderful to the touch and from now on I will never question another bimmer owner that wears driving gloves. And even though the N54 engine is known for having some issues, in Martin’s three and a half years of ownership he experienced none and mind you, this is not a garage queen, it’s his daily driver and a trusty long journey partner. But yeah, after spending the day with Martin’s car, I now fully understand why someone would chose a 335i over an M3 without looking back. With a few tweaks here and there and some well thought out mods, you can turn a 335i into a rather special machine. Granted, it’s not a special as a naturally aspirated V8 but hey, neither are the maintenance bills.